If you are a professional involved in the complex issues of child maltreatment you need The Quarterly! The Quarterly Update, published by The Ray E. Helfer Society, is a journal that reviews recent peer-reviewed articles in the medical literature on the diagnosis, prevention and treatment of child abuse and neglect. 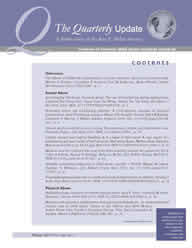 Members of the Society receive The Quarterly automatically as a member benefit. Non-members may subscribe by selecting the subscription option under Quarterly Links. Medical, legal, mental health and social work professionals known for their expertise and experience summarize the articles, chosen from hundreds of medical journals. These experts address the validity and significance of an article and how it relates to previously published research and clinical experience. This timely information keeps child abuse professionals apprised of the most recent findings, informs their clinical practice, and improves their ability to make sound decisions, based on the latest data. select "Access the Q" from the side menu or select this link to login and access the current and past issues. If you are already logged in, you will be taken immediately to The Quarterly Home page. For me, as a generalist doing child protection work part-time, The Quarterly has been an invaluable resource helping me to keep up with the explosion of literature in the field…"